At Affordable Rent-A-Car And Sales, we offer both Utah residents and vacationers an inexpensive way to experience the area. Whether you’re traveling here with family to check out the sights at Yellowstone or Jackson Hole, Wyoming, or you’re enjoying the slopes with friends at any of the area’s resorts, come to us for all your RV rental needs. 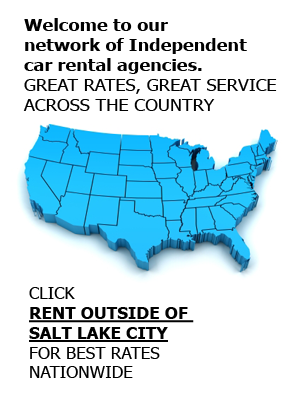 Submit an online reservation today, or contact us directly at (801) 266-7368 for more information about any of our car rental services, including airport and production rentals. Big Cottonwood Canyon – Full of snowy ski slopes, hiking trails, and beautiful views, Big Cottonwood is home to pure character and excitement.Natural History Museum of Utah – View displays of prehistoric fossils, mummified remains, and other displays once encased in the Utah soil for millions of years. Temple Square – A Mormon landmark, Temple Square offers guided tours throughout the 35-plus acres it rests on. Make sure to check out and take photos of the enormous musical organ! Brighton Resort – Those looking for lodging need not look further than the Brighton Resort and its allure of being right in the middle of SLC. Along with our rental vehicles, we also sell used cars at our main location in Salt Lake City, Utah. We have great deals on high-quality vehicles that can be in your garage tomorrow. Call us to schedule a test drive. The city of Moab is famous for a reason; with tons of sights to see and food to eat, the city is a vacationer’s paradise. Grab a Moab car rental from us, and partake in some activities in SLC and the Moab area. Canyonlands Ballooning – There’s no denying that Canyonlands Ballooning has more to offer than most places in the world. Enjoy a hot air balloon ride above the massive canyons, and snap some take-home pictures for your photo album.Canyonlands National Park – Camping in Moab? You’d be hard-pressed to find a better campground than Canyonlands National Park. Make your next trip into UT or WY one to remember. Contact us at (801) 266-7368 today for information about any of our rental vehicles, including vans, SUVs, trucks, and cars. We also offer a complimentary airport car rental service to those who need shuttling to or from the airport.